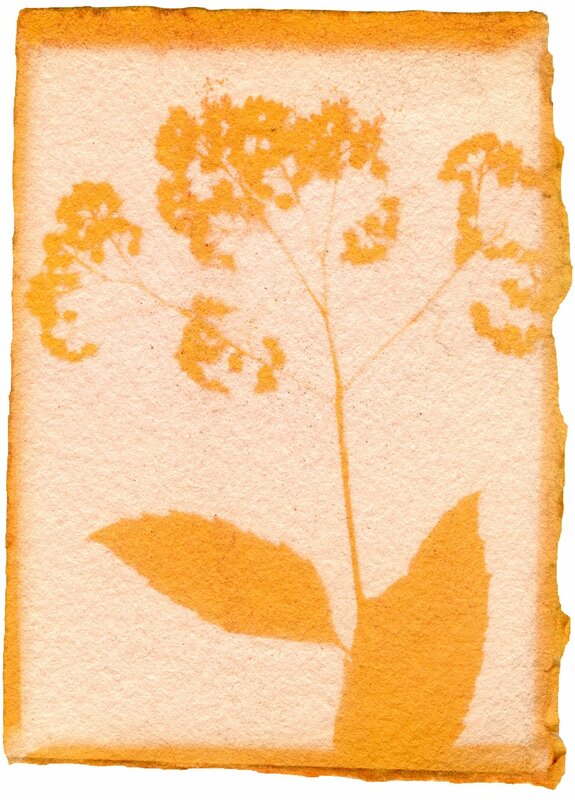 Anthotypes are made by combining an organic matter and a solvent to create their bright color solution. That solution is called the emulsion and is coated onto a surface. The subject placed on top in a contact frame and then placed out in the sun for exposure. The sun bleaches out the exposed area crating a positive image of the subject, abstracted to monotone colors. These works, by the nature of their process, are the essence of the living things the represent. The print is at the whim of nature. No two can be alike, as no two days are exactly the same. The sun moves and sets in different degrees and times. The days intensity can cause a print to bleach out faster or slower. The organic matter itself has innate qualities that change from organism to organism. When they are finished and taken out of the frame, they hit their “half-life” and start to fade if they are exposed to more light. By the same matter of how they come into existence, they begin to degrade. Light starts to bleach out the positive image that was formed over those days of exposure until the sheet of paper turns to one dim shade of its former self. They represent the life cycle of the living things they were created from, and in the creation and decay are the representation of those things essence.